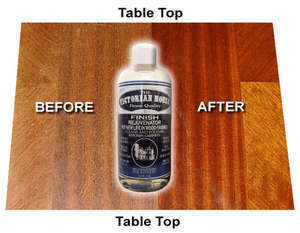 Finish Rejuvenator, Wood cleaner, kitchen cabinets can look new again. SELECT THE AMOUNT OF REJUVENTOR YOU NEED FOR YOUR JOB. 6 is enough for the entire house. Baseboards, wood floors, furniture and antiques. If its wood it will look great after on easy application. Order extra to save money it doesn't loose its strength. This product is not a cover up its a repair. One easy application lasts for years. Very economical. Saves you Hundreds of Dollars. No Need to Strip and Sand..Just Rejuvenate.